Picking the right type of knee sleeve is as essential to your fitness routine as the weights and equipment you’re using. Even if you’ve never experienced any knee issues in the past, the right sleeve can protect your knees from injury, improve your performance and even help your knee heal after a minor mishap. The trick to selecting the best knee sleeve for your needs is examining the exercises you plan to do while wearing it. Knee sleeves are not made equal, so don’t just select any old one for your workout. 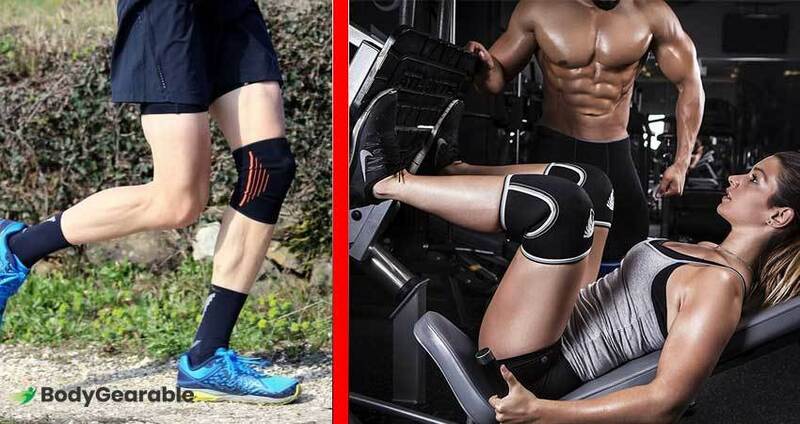 Instead, think long and hard about your fitness routine and do a little research to find the best knee sleeve for you. As any weight lifter can tell you, squats are no joke – especially when it comes to the knees. Since balance is necessary for this staple exercise, you will need a sleeve that offers support and stabilization. Historically, weightlifters opt for a 7mm-thick knee sleeve that gives the knees a tight feeling around the joints so that squats can be performed precisely and safely. Created by athletes for athletes, Bear KompleX equipment has been noted for the quality it lends to an enhanced workout. Their knee sleeves are no different. Offering support and compression, these knee sleeves can help with most exercises ranging from squats to box jumps and even running (depending on the thickness level you select). Although they are also available in 5 mm, it’s recommended to opt for a 7 mm-thick knee sleeve if you plan on doing squats or other weightlifting exercises. The snug fit promotes blood flow and reduces pain during your workout, helping to eliminate injury. Take note of the measurements, as many reviews cite the knee sleeves as being tight – so be sure to measure correctly to get the best fit. Considered a high-quality knee brace, this orthopedic knee support and compression brace can help stabilize your squats and support your knee. Receiving mostly rave reviews, the braces appear to provide the right fit with durable materials designed to last. Although some older reviews reference that the braces appeared to rip after little use, the company replied that they recently updated the neoprene material they used for better quality. Each order comes with a pair of knee braces and a bag for easy storage and carries in your gym back. With some simple care and cleaning, they should last for years. The materials are easy to clean, which is great for preventing a lingering gym smell after every use. Some reviews report a strong chemical smell from the sleeves when they first arrive. However, allowing them to air out seems to alleviate the smell quickly. Designed for maximum support, these sleeves provide graduated compression that keeps your knees firm and stabilized throughout your squats. Now, you can focus on other areas of your form, enhancing your workout. The orthopedic support reduces the risk of injury and can even aid in joint recovery. Made from sturdy neoprene material and reinforced stitching, there are almost no reports of wear and tear that you may see from other companies. Made to last long, the ergonomic design fits comfortably without any worry of sliding off during a crucial point of your workout. While there is the initial smell of chemicals upon delivery of content with, reviews report that it subsides within a couple weeks of airing out the knee sleeves. Compression fit prevents sliding off during squats or other movements. With such high-quality knee sleeves on the market, you are sure to find one that fits your squatting needs. However, be aware that tears are common, especially after a few months. Inspect your knee sleeves regularly and provide regular cleaning and care to keep them in tip-top shape. To guarantee the right fit, properly measure your knee and follow the company sizing chart when placing your order. Weightlifting and powerlifting exercises often combine explosive movement with heavy weights. While novices and beginners can often forgo knee sleeves, investing in a high-quality sleeve can help experienced lifters or those who are transitioning to a heavier weight. Once your sessions become more serious, you may want the added stability and support to prevent injury. Lifting weights are stressful on your body, so you want something that can help your joints hold up to the strain. A thicker knee sleeve, like a 7 mm, is often the preferred type for weightlifters. The thicker material better stabilizes the joint during the movements of powerlifting and prevents injury. While there are currently no studies supporting the idea that knee sleeves can improve weightlifting performance, some lifters swear by their ability to lift more when wearing a knee sleeve. As a premium weightlifting brand, these knee sleeves can assist in taking your weightlifting game to the next level. Compression has been proven to promote muscle recovery and prevent injury, so the right fit could do wonders for your workout. And with the unisex design of these knee sleeves, ordering is made easy (as long as you have the right measurements). The material also assists with the healing of injuries, due to the compression and warming effect it has on the knees. The brand, Nordic Lifting, comes highly recommended by professional lifters, especially for those who are looking for an affordable and supportive knee brace. The 7 mm neoprene and reinforced stitching help prevent tearing and contribute to a perfect fit for users. If you order the right size, then you’ll have a well-fitting knee sleeve that will take the brunt of your workout. Also used for squatting, these quality knee sleeves can be beneficial for multiple types of workouts. This is a knee sleeve that will support your joints. These sleeves were designed for burgeoning weightlifters and anyone looking to improve their workout performance. The material keeps knees warm, which helps prevent injury and encourages blood flow. Comparable to higher-end brands, these knee sleeves give the same benefits for an affordable price. Being easy to clean, proper care can keep these knee sleeves functioning and in great shape for years. If you’re a fan of versatile workout gear, they reportedly work well for squats and as shin guards for deadlifting. The fit is snug without being uncomfortable, so you won’t have to worry about losing your gear during a pivotal moment of your workout. Since the material can stretch a bit during the workout, we recommend measuring before ordering to ensure you select the right size. As with any knee sleeve, the correct fit could do wonders for your workout. Designed to add support for a comfortable workout, these sleeves also hold compression throughout your knees’ range of motion. Crafted to outlast any other knee sleeve on the market, the compression and warming properties should hold out through multiple workouts. The company even has a triply reinforced seam to give stronger support to the material and prevent tearing. No matter which size you order, every sleeve is a full 30CM length, so you get full coverage for your workout. Even with the extra length, the design is soft and stylish, giving you a sleek look while still supporting your workout. With the ability to work with your movements and warming properties to enhance blood flow, these knee sleeves could be just what you need to level up your workout. Since powerlifting and weightlifting require support and stabilization, we suggest a thicker knee sleeve that also offers a little more. Warming properties can enhance blood flow to your joints, which can help with the healing process from past injuries and prevent future issues. With the right fit and proper care, a knee sleeve can last for years and may even improve your weightlifting performance. Crossfit is a relatively new form of fitness that has popped up over the last couple of decades. The purpose is to fit as many reps as you can within a set amount of time, trying to beat your own record (or others’) during your workout. Most CrossFit exercises are comprised of weightlifting and cardio moves. With so much going on during a CrossFit workout, you’ll need a knee sleeve that can keep up with your moves. To provide support and flexibility, most CrossFitters opt for a 5MM to 7MM thickness in their knee sleeves. Here are our recommendations for a high-performance knee sleeve for your CrossFit needs. Rehband is a pretty revered name in the fitness community, especially when it comes to knee sleeves. With over 60 years of service, they’ve been able to design sleeves that support the average athlete’s movement and stability and prevent injury. With compression and warming properties that enhance blood flow, you can have a longer lasting workout with a reduced chance of injury. No matter your level of working out, from novice to expert, their sleeves work to improve your workout and protect your knees from injury. With support surrounding the knee, you’ll have the optimal range of motion throughout your workout. The full coverage design is a fan favorite among reviewers, who appreciate the extra support and enjoy the compression and warmth throughout their fitness routine. With proper care and maintenance, these sleeves can last for years. If you prefer to custom fit your knee sleeve, then these Mava Sports Knee Wraps could be for you. With velcro strap hook and loop closure, you can adjust a size that works best for your knee. If any swelling or gains occur, you can easily add or reduce the circumference of your sleeve, leading to a better bit. With this control, you can also determine the best compression for you, depending on your exercise. For CrossFit, you need more maneuverability for your workout. And while it’s great to use as a knee sleeve, you can also re-wrap to use it as a brace, band or defender due to the versatile band design. The durable material holds up a plethora of exercises and workout staples, including squats, weight lifting, and cross training. Elasticity wears out after multiple uses. With the same benefits of the Rehband Rx 7MM, this 5MM knee sleeve offers the same support with slightly less thickness, resulting in a better range of motion for the user. With the support and stability, users with knee injury reported a more comfortable experience and better performance while weightlifting. The added comfort eliminates the need to switch knee sleeves or to remove them while changing exercising, an action that can impede your gym time. Instead, the flexibility allows users to seamlessly transition from weightlifting to cardio without any discomfort or lost support – an essential component of CrossFit. If you’re feeling sore knees and strained joints during your Crossfit workout, a knee sleeve could be the solution for better comfort and improved performance. To find the best sleeve for your workout, be sure to check your measurements and order the best fit. We recommend a 5MM to 7MM sleeve that can provide a range of motion and additional support during your fitness routine. Running is a great exercise but results in your knees taking the significant impact. Likewise, arthritis is a common condition that can leave your joints feeling stiff and achy, along with other debilitating symptoms. However, with the correct support and equipment, you can reduce your pain and gain the support you need to continue your workout without injury. Knee sleeves are a great way to overcome the pain that can come from running or arthritis. The compression and warmth lead to increased blood flow through joints, resulting in diminished pay and reduced chance of further injury. So don’t give up on your workout just yet. Picking a 3MM to 5MM thick sleeve will give you the support you need with the range of motion to keep you moving. This knee sleeve boasts support and comfort for its users. With soft material and adjustable velcro straps, it fits snugly against your skin without rubbing or irritating your knee. Unlike most braces, which are stiff and uncomfortable, this flexible design is lightweight and can be used for various exercises. If you’ve suffered a knee injury but are ready to get back on the horse, the soft material and adjustable design allows you to get back into the game. Offering enough support to keep your knee stable, the material allows you to still obtain your full range of motion. Running has never been made easier and the added protection reduces the chances of knee injuries during your workout. This anatomically shaped knee sleeve prevents injuries and can accelerate recovery. Made from lightweight material, it’s flexible enough to support a wide range of motion. The universal design fits men and women comfortably and naturally conforms to your knee and leg shape. Similar feel to an ace bandage, the breathable material is flexible and durable. You can easily run, hike, walk and perform other sporting activities comfortably. The compression design helps protect your knee from injury and enhance blood flow to your joints. The fit is designed to be comfortable while still staying in place through various activity. The slim fit also allows you to comfortably wear the sleeve under long pants and sweats without any bunching or slipping. Lacking the bulkiness of most knee sleeves or braces, you can move around easily without compromising support. This knee brace takes things a step further when it comes to comfort and pain relief. The silicone gel strips at the top of the sleeve help lock it in place to prevent slipping during your workout. The compression is designed to reduce pain and swelling while promoting blood flow to your joints. It offers pain relief and moderate support for those suffering from knee pain or injuries. The lightweight material makes it easy to move around through various exercises, including running, walking and various sports. The flexible design allows the sleeve to move with you naturally, without compromising support. If you want to try other exercises, the versatile sleeve also offers support for other exercises, like weightlifting so you can seamlessly transition to your next fitness routine without having to change sleeves. Some reviewers even boast it’s so comfortable that they can wear it all day (perfect if you are staving off pain from a knee injury). When it comes to running and athletes suffering from arthritis, thin knee sleeves are the best solution to providing protection without impeding your workout. For the best results, we recommend any of these knee sleeves. Depending on preference, an adjustable fit or anatomical design could improve your performance and even work as rehab for your knees.